Summer is the perfect time of year for outdoor craft projects. When the weather is warm it is a lot of fun to take your craft projects (and your messes) outside. Here are some ideas for easy and fun outdoor craft projects the whole family will love. The best outdoor craft projects can be done outside, and they can remain outside during the summer. One of the easiest outdoor crafts for kids of all ages is painting flower pots. You can purchase terra cotta pots in a range of sizes at garden supply stores, craft stores and floral supply stores for just a few cents each. Raid your stash of paints for fun spray paint or acrylic paints and brushes (or buy some fresh acrylic paint). Paint the pot a base color if you like (this is a nice touch if you have multiple kids painting pots and you'd like them to look like they go together) and allow them to dry before letting the kids paint all over them. An added bonus craft is that you can take the kids to the nursery and let each child pick out a plant to grow in his or her pot. Stay away from plants you want to eat just in case the paint seeps into the soil. A similar simple craft is painting rocks. Remember the trend of pet rocks? Now your kids can have real pet rocks, actually painted like animals, or anything else they'd like to paint on them. To start this craft, go for a walk or visit a park with a stream. Allow each child to pick out a relatively smooth, flat rock for painting. Wash the rocks with the garden hose when you get home and let the kids paint them with acrylic paint. These rocks can be used as decoration in the garden or flower beds, or even as paperweight gifts for Father's Day, Grandparent's Day or any other holiday in the summer or fall. If you're planning a barbecue for the Fourth of July or another summer holiday, have the kids paint rocks with that theme. They can then be used to hold down the tablecloth on the outdoor table or to keep other things from blowing away, or just as a decorative centerpiece. Wet down a large white sheet with water and hang it over the fence or on the clothesline, or just spread it on the ground. Use tempura paints to doodle or paint all over the sheet. When you're finished, or if you just don't like what you've painted, you can rinse the paint out with more water. "Painting" with water can be fun for little kids. Simply give them a bucket of water mixed with baby shampoo or liquid dishwashing detergent and a couple of big brushes. They can "paint" everything in sight and you won't be able to see it when it dries out. Crayola is now making washable markers that are meant to be used on glass and windows. For a small investment your kids will have tons of fun drawing on the inside and outside of windows, mirrors and other glass surfaces, but it will all wash away easily. There's always sidewalk chalk, too. 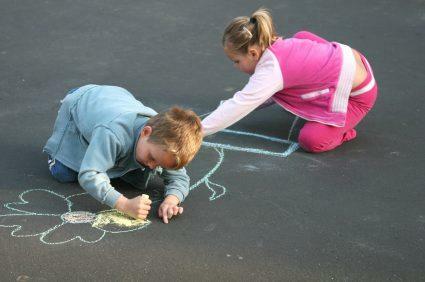 Challenge your kids to a game of hopscotch or get down there with them and draw your own masterpiece. Summer should be fun for grownups, too, right? Making bird feeders is a classic outdoor craft that all kids seem to love. You can make almost anything into a bird feeder, from a gallon plastic jug to a flat tray that goes under a potted plant, a pine cone smeared with peanut butter or even just an old baking sheet (though there's not much crafty about that). If you have older kids who can use a hammer and nails, you can construct your own basic birdhouse shaped feeder pretty easily. Just make a box with three sides that are the same length and one side that is shorter (so you can reach to put birdseed in). Make the top have a peak like a roof or just nail down another flat piece of wood. The easiest recycled bird feeder is a milk carton, because it's exactly the right shape. Cut a couple of doors out of two sides, making sure they are far enough away from the bottom of the carton that food will fit down there. Make a roof out of popsicle sticks and poke a dowel through the box to make a perch. Fill your bird feeders with seed you buy at the hardware store or make your own mix out of unsalted sunflower seeds, millet, thistle seeds and corn. You'll probably need to buy your ingredients from a wild bird center so you know they are safe for the birdies to eat. Once you've made your feeders, decorated them and filled them, encourage the kids to play or sit quietly in the yard and wait for some feathered friends to come visit! There are many different stepping stone kits on the market that allow you and your little ones to easily make personalized stepping stones to be used in your garden. These kits are a fun outdoor craft for kids of all ages. If your kids are too young to actually mix up the stepping stone mix, at least they can help decorate the stone. A great, simple way to make your stepping stones unique is to have each child put their handprint on the stone. If you make one every year you'll have a garden full of memories in no time! Just remember to date each one so you know what you're remembering.